Tiger's eye is a unique and mysterious member of the quartz family. It ranges in color from rich, golden yellow to bronze and brown. 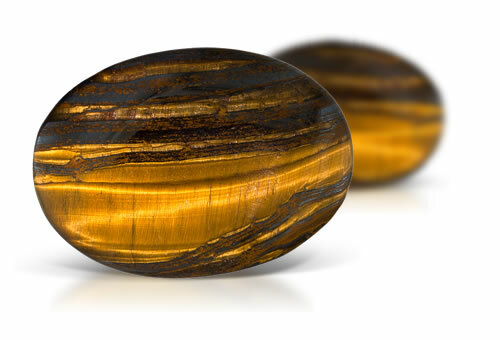 Best seen when gems are cut en cabochon, tiger's eye displays an optical phenomenon known as chatoyancy. Unlike other chatoyant gems, tigers eye quartz is made up of quartz with intergrown fibers of amphibole that were altered to golden or rusty-brown limonite. When light hits the surface of this gem, a silky, wavy shimmer moves across the surface of the stone resembling the eye of a tiger. A related variety of quartz, called hawks eye, is blue due to unaltered inclusions of crocidolite. Misnomer: crocidolite. Tiger's-eye is formed by parallel intergrowth of quartz crystals and altered amphibole fibers that mostly turned into limonite. Tiger's-eye has a wavy fibrous structure. If the stone is dyed there will be dye concentrations along the fibers.